Day 299: Olympics and Olympians - an inspiration! Olympics makes its way every four years and every Olympic leaves us with something more than the event itself. I remember one of the first stories I got to hear of the Olympics was that of Jesse Owens and Luz Long. It was the incident that took place in 1936 Berlin Olympics. The place and the period matters here as this was the time when Hitler's nasty Nazi regime was on in Germany. Hitler's disdain for Jews and non-whites was popular and Jesse Owens was an African American. Despite that Luz Long went ahead and offered him advice to help him qualify for the finals and in the finals even publicly acknowledged and shook hands with Jesse Owens for winning the 100 m. This probably might not sound so odd today but at that time for a German white man to appreciate and be nice to an African American was not expected. That story is one that I can never forget. The spirit of sportsmanship. I even remember how Jesse Owens later said, "You can melt all the medals and cups I have and it won't be plating the 24 carat friendship I felt for Luz Long at that moment". These lines are something I read when I was very young and I remember that so well whenever I think about Olympics and sports. 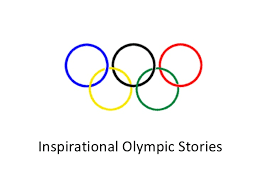 This year's Olympics also has some interesting and inspiring stories. One such is from the team Refugee Olympic group 2016. Yay! I am rooting for this team as much as I support the others. One such terrific story is by a young lady from this team. She is Yusra Mardini. When I read about her story I was moved in joy and tears. We have an 18 year old girl who is without a 'country' in every sense and has sought refuge in Germany. A swimmer since her young age, she has been having a great life until she was about 13 years. With the disastrous civil war that rocked the country in 2011 she like the many others put a hold on to her dreams. However, when their home was destroyed in the war she decided to leave the place for good. She and her sister were arranged to be smuggled through Greece along with 18 other immigrants in a boat that could only hold less than 7 people. When the dinghy couldn't handle the weight and stopped working in the Aegen Sea, Yusura, her sister, and three other members jumped out in the cold sea and swam to push the boat safely to Lesbos. It is unfathomable. This story reminds me how blessed I am to have a country to call mine, a home to call mine, a life that is not this unstable. For an 16-17 year old to go through this hardship fighting the cold waters and helping everyone reach the shore to safety shows her grit and capability. Whether she wins the Olympics or not, she truly has won in life. She has not only saved her own life but the lives of many others (kudos to her sister and other swimmers too). The other person that inspired me is Zahra Nemati representing Iran. Though a trained Taekwondo player until 18, an accident left her paralyzed below waist. It shattered her spine but didn't deter her confidence. She retrained to compete in archery in a wheel-chair and is eligible now for both paralympics and Olympics. Whatey story ! There are many more such stories and every story is an inspiration. I like to listen to these stories as they help me be better or at least make me take steps to be better every day.